Esta fue la pelea que todo mundo espero de Hector Lombard cuando recién entro a la UFC, una obra maestra de violencia que suele terminar con sus oponentes destruidos en el suelo. Esto llego una pelea después de lo que el hubiera deseado, pero es un excelente comienzo. Eliminando de nuestras mentes su decepcionante presentación contra Tim Boetsch en Julio, Lombard peleo con enorme agresión de principio a fin, destruyendo a Rousimar Palhares en un TKO dentro del primer round de su pelea en el evento UFC on FX 6. La finalización llego en el minuto 3:38. Palhares en verdad nunca tuvo una oportunidad, ya que Lombard continuamente lo acoso y por lastima Palhares estuvo girando a su derecha – la mano de poder de Lombard. Antes de la finalización Lobard mando a la lona a su oponente con un fuerte gancho derecho, pero Palhares fue capaz de cubrirse y subsecuentemente sobrevivir. Lombard mejora su récord a un 32-3-1 y vuelve a la cima de la división mientras que Rousimar pierde por segunda vez consecutiva y baja su récord a un 14-5. Hector Lombard has a new opponent, but he won’t be fighting on Aug. 4. UFC officials announced late Wednesday evening that the former Bellator Fighting Championships middleweight king will face Tim Boetsch at UFC 149 in Calgary on July 21. Michael Bisping was originally slated to face “The Barbarian” on the card, the “Ultimate Fighter” Season 3 winner was forced to withdraw from the contest due to an injury suffered while training. It was the latest in a long string of injury woes for the Las Vegas-based promotion, which recently lost Brian Stann -- Lombard’s initial matchup -- to an undisclosed injury earlier Wednesday. UFC 149 takes place at the Scotiabank Saddledome and is expected to be headlined by a featherweight title tilt between reigning champion Jose Aldo and Erik Koch; also on the bill is a heavyweight clash pitting Antonio Rodrigo Nogueira against Cheick Kongo. Lombard enters his UFC debut riding a 25-fight unbeaten streak. The 34-year-old Cuban went unbeaten in eight Bellator appearances, most recently besting Trevor Prangley at Bellator 58 in November. The American Top Team representative owns notable victories over Alexander Shlemenko, Brian Ebersole, James Te Huna and Joe Doerksen, among others. After posting a 3-3 mark to begin his Octagon career as a light heavyweight, Boetsch has appeared rejuvenated since dropping to 185 pounds prior to UFC 130, defeating Kendall Grove, Nick Ring and Yushin Okami in his first three middleweight bouts. 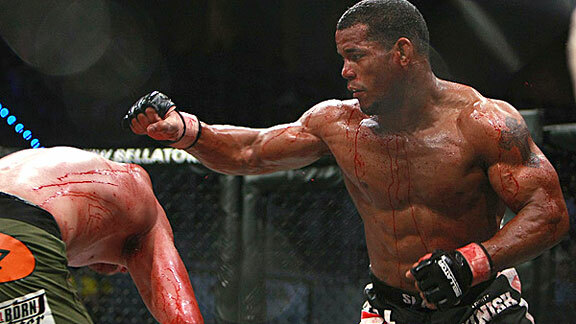 Dave Mandel/Sherdog.com Welcome to the big leagues: Hector Lombard won't get any soft touches in the UFC. The one thing that any successful fighter heading into the UFC will hear is this: He’s overrated. He hasn’t faced any real competition. Somebody’s about to come crashing down to earth. Somebody is about to get exposed. That "somebody" this time happens to be Hector Lombard, the popular Bellator middleweight champion who has rattled off 20 victories in a row, including eight as the company’s flagship. Lombard is a menace at 185 pounds and is sculpted like a Frank Frazetta overlord, but the big gripe against him is he’s beating guys named Falaniko Vitale and Herbert Goodman instead of cats like Mark Munoz and Rousimar Palhares. All that changes, now that Lombard makes his way to the UFC. Instead of facing UFC castoffs like Jay Silva and Joe Doerksen, the 34-year old American Top Team fighter will face UFC regulars. It’s a completely different vantage point. Lombard’s new assignment is to covert guys into UFC castoffs rather than feast on what’s left of their good names. Back when Jorge Santiago had built up a new head of stream in Sengoku, he became a popular dark horse pick against Brian Stann at UFC 130. What did Stann do? He punched the daylights out of him. And wouldn’t you know that just as Lombard brings his 25-fight unbeaten streak into the UFC, Stann is coming off a big victory over Alessio Sakara and needs an upgrade in opponent, just as all the bigger names are occupied? Enter Hector Lombard. The great thing about this fight is both guys like to bang on the feet. Lombard is a precision striker who carries a lot of power. He likes to fight guys that get right up in his wheelhouse and tempt him into uncoiling. That’s Stann, who makes it his duty to oblige brawlers. (And just as often, shut them down). Shields has bounced back and forth between 170 and 185 pounds, and after a fairly subpar run in the UFC’s welterweight division, it looks like he’ll bulk back up. Bottom line is, he wasn't losing to slouches, either -- Georges St. Pierre and Jake Ellenberger (under trying circumstances, dealing with the passing of his father) never looked like easy outs. But the last time we saw Shields as a middleweight he looked ... if not great, then totally resilient. He beat up Jason Miller for five rounds, and then improbably defended the Strikeforce belt against Dan Henderson in a fight he had his wits scrambled in the first round. Not to name drop, but Shields was the last guy to defeat Henderson, who is now set to fight Jon Jones for the 205-pound title. Think he wouldn’t like to punch some holes in Lombard’s lore? And for those desperate for storylines or loose patriotism, it’d be the battle of the Americas -- American Jiu-Jitsu versus American Top Team. Hey, while we’re restocking the UFC’s middleweight division with valuable intrigues, why not bring Strikeforce middleweight champion Luke Rockhold into the UFC fold to face Lombard? It’s not the likeliest scenario, but Rockhold has just come into his own at a time when Strikeforce has become a weekend skeleton crew. Think he likes the idea of challenges named Keith Jardine or, maybe at some point, Bristol Marunde? It’s fun to imagine a Rockhold/Lombard scrap. You’ve got two guys who aren’t afraid to fight in the pocket, each with a durable chin and sadistic intentions. It has “back-and-forth war” written all over it, a great UFC debut for both ... but it looks like Rockhold will get that long-awaited battle with Stikeforce contender Tim Kennedy, thus rendering this flight of fancy moot. Truth be told, we’re merely throwing Rockhold’s name out there in the off chance that matchmakers Sean Shelby and Joe Silva are combing the Internet for suggestions. Again, we’re dealing in Strikeforce property (read: ultimately Zuffa’s), but Souza hates the pace of fighting once every six to eight months. And if the promotion does make Kennedy versus Rockhold, that means Jacare is going to be fighting some unmentionable. If the UFC brought Souza over to face Lombard, you’ve got the strutting fisticuffs that languished in Bellator for too long against the tall-grass predator with the aggressive, limb snatching jiu-jitsu. What better? And how would that be for a red carpet rollout for both guys into the Octagon? You laugh. I can see you laughing. But let me put Herman’s name into perspective. For one thing, he has been completely rejuvenated since coming back from his knee injury and setbacks, having won three fights in a row. For another, “Short Fuse” is a finisher just like Lombard. In every one of those fights he dusted his hands of the opponent, beginning with Tim Credeur (whom he TKO’d in 48 seconds) and ending with Clifford Starks (second round rear-naked choke). The guy he beat in-between? Why that was Kyle Noke (via first round heel hook), the same guy who took Lombard to a draw back in 2007. Herman is creeping up on the pack in the middleweight class, and Lombard is a big step up in opposition. Here’s the rub, though: So is Herman a big step up in competition for Lombard. Either Lombard could treat Herman as an appetizer to the main course, or he could, for the first time ever, find himself with a nostril full of smelling salts. Lombard subira al octagono el dia 28. Hola Amigos el próximo 28 de octubre,el matancero Héctor Lombard quien posee un record de 26-2-1subira de nuevo a los octógonos para defender su campeonato de peso medio en la compañía Bellator esta vez contra Alexander "Tormenta" Shlemenko un rocoso peleador que tiene un impresionante record de 30-4. Mientras que muchos observadores pronostican mas de lo mismo sin embargo podemos decir que en este caso Shlemenko es un luchador valiente, difícil considerado un gran striker que de seguro no sera como las anteriores peleas de Lombard en que ambos contendientes dieron muestras de una bajísima calidad competitiva, sin dudas que esta pelea esta levantando gran expectación. Solo agregar que este programa se transmitirá en vivo por Fox Sports Net a las 8:00 pm. Otro combate que se las trae de seguro un plato fuerte entre la sensación del momento en las MMA Brock Lesnar (5-1) que de nuevo expondra su cinto esta vez contra el gran Caín Velasquez (8-0) este sera en el programa UFC 121.con fecha 10 /23/ 10 y sera transmitido en Vivo en pay per View a las 22 h 0.